Harmonix has taken the wraps off the entire 83-song on-disc soundtrack for the upcoming Rock Band 3, a veritable cornucopia of rock that ranges from the awesome to the awful. This, I suppose, is what it's like to feel old. The Rock Band 3 set list starts off strong with a few great tracks from the 60s, gets serious in the 70s, hits a full-out stride in the 80s, tails off badly in the 90s and then we get into the new millennium and I have no idea who any of these people even are. Poni Hoax? Rilo Kiley? This must be how my dad felt. "The addition of keyboards and vocal harmonies to the Rock Band platform massively broadens the music selection available to our players," said Paul DeGooyer, senior vice president at publisher MTV Games. "You haven't sung Queen's epic 'Bohemian Rhapsody' unless you've sung the harmony parts - and you can't do that unless you have Rock Band 3." That's entirely untrue, of course, but we'll assume that DeGooyer is speaking solely in videogame terms and not belabor the point. In any event, here's the list! Pretty Girls Make Graves, "Something Bigger, SomethingÂ Brighter"
* = Track will be included with the Nintendo DS version of the game. It's a pretty impressive set, although how awesomeness like "Caught in a Mosh" and "Midlife Crisis" ended up parked next to "Sister Christian" is completely beyond me. Man, I remember when Night Ranger used to be cool. 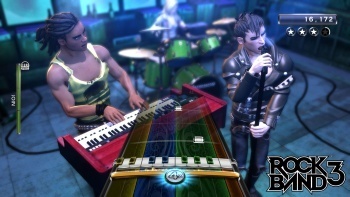 Rock Band 3 is set for release on October 26 for the Xbox 360, PlayStation 3, Wii and Nintendo DS.